In this 10th grade math worksheets 2, you will find 10 problems from different topics of math. 1. Find the number of integers between 60 and 600 which are divisible by 9. 2. The sum of a two digit number and the number obtained by reversing the digits is 66. If the digits of the number differs by 2, find the number. 3. Find two consecutive odd positive integers, sum of their squares is 290. 4.A boy of height 90 cm is walking away from the base of a lamp-post at a speed of 1.2 m/s.The lamp is 3.6 m above the ground level, find the length of her shadow after 4 seconds. 5. If the points A (1,6), B (8,2), C (9,4), D (b,3) are the vertices of a parallelogram taken in order, find the value of b. 7. A farmer wishes to start a 100 sq.m rectangular garden. Since he has only 30 m barbed wire, he fences the sides of a rectangular garden getting letting his house compound wall act as the fourth side fence. Determine the dimension of the garden. 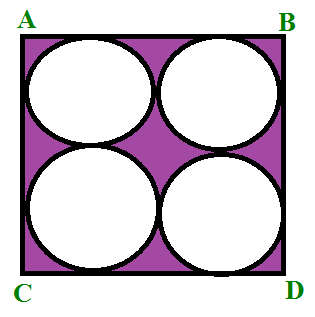 8.Find the area of the shaded portion in the below figure, where ABCD is a square of side 14 cm. 10. The standard deviation and the mean of 20 values are 21.2 and 36.6.Find the coefficient of variation.